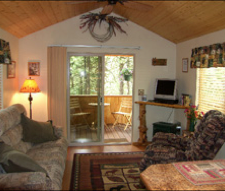 Looking for a vacation rental cabin in Sumpter, Oregon? Well, look no more! 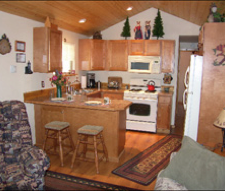 The Lazy Moose Cabin is a vacation rental cabin that offers lodging accommodations year-round. The Lazy Moose Cabin offers an intimate retreat for 2, where couples can enjoy the Spirit of the Mountains and the Magic of Sumpter. 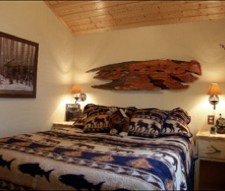 The cabin is tastefully decorated in a wildlife theme (hope you like Moose!) and is outfitted and supplied with just about anything you will need for your fun vacation in Sumpter. The Cabin is located in the City Limits just 3 blocks east of the Downtown District. This Vacation Cabin has a fully equipped kitchen, queen bed, and a TV/VCR/DVD (movies can be rented at the Gold Post Mercantile or Stage Stop Service Station & Groceries, or bring your own). The rate for double occupancy is $95 per night (3 minimum night stay required during Flea Market events and 3 day holiday weekends). There is an $95 deposit (one night's stay) required upon the booking your stay. If you have an RV in your party, the Cabin has hook-ups for an RV (electric, water & sewer) for an additional $25.00 per night (4 guest maximum in RV area). The RV space is available from Mid-May through Mid-October. Maximum RV length accommodated is 28'. At the Lazy Moose Cabin Rental, you can jump on your Snowmobile or ATV and ride across the road from your cabin to the Snowmobile Trailhead. Ride your snowmobiles or ATVs on over 350 miles of beautifully groomed trails. Other Winter recreational activities include cross-country skiing and snowshoeing. During the Summer and Fall, enjoy fishing, hunting, hiking and boating (Phillip's Reservoir) or panning for gold. During your stay, visit the Sumpter Municipal Museum, the Cracker Creek Museum of Mining, the Sumpter Valley Dredge, and the Sumpter Valley Railroad (these attractions are open May through September). Take a leisurely drive on the Anthony Lakes Loop Road. The Anthony Lakes Road has spectacular scenery for which the Anthony Lakes Area is famous. The loop and its spurs overlook lush high meadow basins, glacial lakes, craggy ridges, and rugged peaks. In the summertime, Alpine wild flowers paint the meadows, forest, and granite outcropping's (road closed during Winter). Do you enjoy hiking? Day hike the Elkhorn Crest Trail. The trail begins at Marble Pass (7600') and concludes at Anthony Lakes (7800') with climbs up to 8400'. This very scenic route follows the ridge of the Elkhorn Range, and totals 24 miles, but most hikers simply day hike the trail to Twin Lakes, which is a great way to spend a day. You will encounter awesome vistas from the Elkhorn Crest Trail skyline. 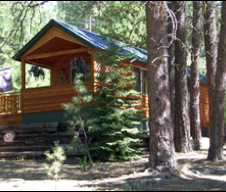 Stay at the Lazy Moose Cabin and explore the Sumpter Valley.